The candidate of the Social Democratic Party (SDP), Omisore in the Osun State governorship election, has reiterated his resilience and his unshakable stand and has told his supporters to “go with any political party that believes in what we in the SDP stand for”. He neither favours the PDP nor the APC. Since effectively dropping out of the race for the rerun election, following the very high but close votes of Ademola Adeleke, candidate of the Peoples Democratic Party (PDP) and Isiaka Oyetola of the All Progressives Congress (APC), Omisore has been visited and courted by both camps in an attempt to swing his supporters votes to a side. It has been reported that APC was planning to offer him a ministerial slot in other to gain his votes and the PDP has also visited him in an atempt to sing his votes to them. However, according to a statement by Jide Fakorede, his media aide, Omisore had decided he would “not negotiate for personal gains and abandon my people and he neither favours the APC or PDP”. After over 72 hours of pressure on him by both the leadership of the People's Democratic Party (PDP) and All Progressives Congress (APC), the Social Democratic Party (SDP) governorship candidate in Osun State, Senator Iyiola Omisore, has said that what is paramount to him is the practice of true democracy in Osun State,” read the statement. “Omisore firmly states that he will never renege on his promise of good governance, accountability and human dignity in Osun state.” "Osun state has always been a stellar example of democracy where the people have consistently and freely expressed their franchise to determine who governs them. 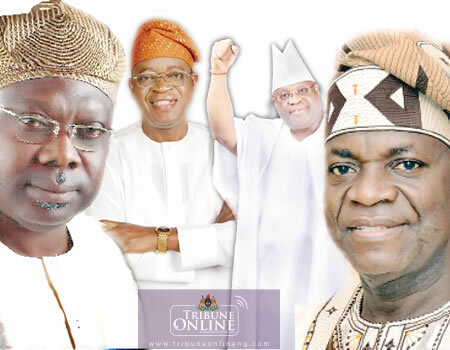 "My alliance is with the people of Osun state irrespective of the political party they belong. I want my people to be treated with the dignity they deserve. I desire that they have a government that will be accountable to them. I want them to experience the good governance the founding fathers of this state envisaged. I have told the parties that have solicited for my support to approach the electorates and ask for their mandate as I have assured them that I will not coerce them for political or social power. It is because I have kept my promise that has made me enjoyed their unalloyed support all these years. "Their voices of demand for good governance, accountability and human dignity should continue to be heard as well as salaries paid. All these are what I stand for and which the SDP had promised the people all through our electioneering campaigns. They are still paramount to me as we collectively chart the way forward for the governorship elections rerun in Osun state." Omisore assured his followers and admirers that he would not abandon his campaign promises even as he engaged all stakeholders on the way forward to ensure the progress of Osun State is achieved.